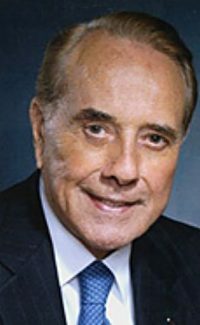 On Jan. 17, leaders of the House and Senate will present a Congressional Gold Medal to former Senate Majority Leader Bob Dole, R-Kan., in recognition of his service to the nation as a soldier, legislator and statesman, House Speaker Paul Ryan, R-Wis., announced. "Robert Joseph 'Bob' Dole was born on July 22, 1923, in Russell, Kan. In 1942, while away at college, he enlisted in the United States Army to serve during World War II, where he suffered devastating injuries while trying to help a fellow soldier. He was later awarded two Purple Hearts and a Bronze Star for his service during the war. "Later, he went on to represent the state of Kansas in the United States Congress from 1961 until 1996 — eight years in the United States House of Representatives, followed by 27 years in the United States Senate. "During his 35 years in Congress, Sen. Dole was a strong advocate for the disabled, prioritizing policy over partisanship to achieve significant Social Security reforms and advance the Americans with Disabilities Act. "Since his time in Congress, Sen. Dole has continued to selflessly serve the American public — especially our nation's veterans." Dole is also known in agricultural circles for his advocacy of nutrition programs to fight hunger, particularly with the late Sen. George McGovern, D-S.D. The Congressional Gold Medal is the highest civilian honor the United States can bestow. In accordance with Public Law No: 115-60, a single gold medal has been struck to honor Dole. The ceremony will take place at 3 p.m. ET in the Capitol Rotunda, and will be live-streamed on Speaker of the House's website.